Our CNC XChange applications have helped thousands of clients around the world overcome the “control incompatibility” issues between Fanuc … Okuma … Haas … DMG Mori … Mazak … and more … G code formats for equipment on their shop floors. Kentech Inc. is now pleased to announce the release of our latest version of CNC XChange that can auto convert Fanuc and “fanuc compatible” G code to Fagor format for 2.5 and 3 axis milling programs. All models of Fanuc controls are supported as the “convert from” format … and Fagor models 8055 / 8037 / 8060 / 8065 / 8070 are supported as the “convert to” format. An option is also available to auto convert Fanuc MACRO B code to Fagor Variable Prgramming format. For additional information and an in-depth look at how CNC XChange operates … we offer a brief release / informational video below. Please visit www.KentechInc.com for more information on CNC XChange and ALL our Real World CNC / Machine Shop Software products. Okuma Corp. is a leader in CNC controls and CNC machinery and laid the foundation for a whole new world of productivity and possibilities with the release of their OSP-P open architecture control in 2004. Among other features, this open architecture allowed for the inclusion of Windows based applications to run directly inside the CNC control. This has opened up a whole new world of possibilities for manufacturers now having the ability to run “apps” as well as full Windows software directly in the CNC control. Kentech Inc. is proud to be recognized by Okuma and to have our Kipware® CNC XChange G code conversion software featured in the Okuma App Store. We are proud that Okuma has recognized the features and power of CNC XChange and the importance and power of G code conversion in the constant battle to eliminate CNC control incompatibility in today’s manufacturing. You can learn more about Kipware® CNC XChange and the Okuma App Store by clicking on the links below. With an internet based business … your website is your company. It is your “brick and mortar store”. So it’s gotta be good !! Kentech Inc. has been business since 1986 … and launched the first version of www.KentechInc.com around 1989. Since then it has gone through quite a few versions as we try to keep it modern, fresh and employing the latest technology. We have always designed and coded on our own and made it a point to learn the latest in web publishing and to employ that technology in our website. In today’s day … it’s not enough to simply put together a website … it MUST function well on all devices. That means on everything from that big PC screen to that small iPhone or Android cell phone screen. Well … we are software people … so we put the same thought, consideration and testing into our website build as we put into our CNC and machine shop software products. If you’re shopping around for CNC and machine shop software … take a look at the website of the company you are considering on multiple devices. If it doesn’t function well on everything … do you really want to consider their software? The latest version of our website was COMPLETELY DESIGNED — CODED — CREATED by our staff of programmers and engineers … no outside assistance whatsoever. And we are pretty proud of it. We invite you to visit the latest version of www.KentechInc.com … and send along any feedback to our Sales Team at Sales@KentechInc.com. Our KipwareXC® – G Code Conversion application has become an industry LEADER since it’s introduction in the ’80’s. We are now engaged in a new upgrade for KipwareXC® which involves our creation of specific CUSTOM PROFILES for specific G code conversions … and we are pleased to announce the initial release. First … let me explain a little about the philosophy and design of KipwareXC® in case you are unfamiliar. KipwareXC® is what we refer to as a “soft coded” application … whereas our CNC XChange® conversion application is a “hard coded” application. In a hard coded app … all of the G code format conversion is built into the software with only a minor set of options defined by the user to handle non-industry-standard programming code … M codes for example. Hard coded apps are designed for specific G code format conversions … like say Fanuc to Okuma … and it’s all built into the source code. In a soft coded application like KipwareXC® … the user defines all of the what-to-convert-into-what using what we call a PROFILE. This gives the software unbelievable flexibility and power … but requires the user to set up the configuration in the PROFILE. Another powerful feature is that the user can create as many different PROFILES as required to handle many different format conversions … the number of conversion types is therefore unlimited. Our new UPGRADE strategy is to create and define specific code conversion CUSTOM PROFILES and make them available to the public … but still maintain the ability to tweak the PROFILES as well as the ability to define new Profiles and enhance existing Profiles. It’s the best of both worlds. Our first CUSTOM PROFILE … created per a user request … was for milling G code to convert between FANUC format to DYNAPATH event type format. Below is a video clip outlining the new PROFILE. We are excited to introduce CUSTOM PROFILES and will be adding new PROFILES as we move forward and receive feedback and requests for from our users. If you have a need for CUSTOM PROFILE to enhance your shop floor machine compatibility … please contact Sales@KentechInc.com or call 508-754-1198 Ext 1. As we continue to ramp up our sister woodworking company … KÄRV … we continue to demonstrate and prove our mantras for our Kipware® machine shop software. Metalworking operations … woodworking operations … both have a lot of similarities and requirements and we continue to prove our Kipware® real world machine shop design and features in our now real world woodworking environment. We recently blogged regarding how we utilize our KipwareCYC® and KipwareQTE® machine shop cycletime and cost estimating software to estimate retail costs for some of our wood products. If you missed it … see the full article HERE. We are also proving our “not every job requires a CAD/CAM system” programming mantra at KÄRV as well. We recently put our KipwareM® – conversational CNC programming software for milling … to work on a shop floor programming project we were working on in the KÄRV workshop. If you haven’t read our article on shop floor programming vs. CAD/CAM programming … it’s quite the eye-opener … you can read the full article HERE. We came up with an idea for a unique clock design that featured a quartz clock movement inside a slice of an oak log. 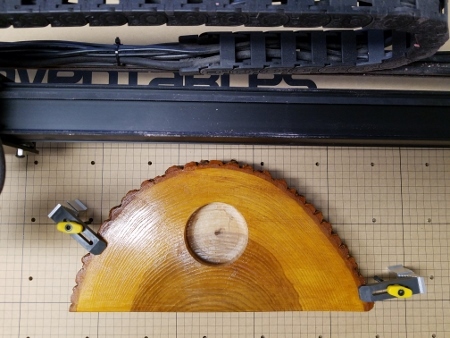 To house the clock body … we needed to mill a 3″ diameter hole in the slice … and we wanted to use our X-Carve CNC router to mill the hole. Simple enough … and it really illustrates how a simple programming project could turn into an overblown programming project if we were to use a CAD/CAM program to create that G code program. In a CAD/CAM system we would have had to first create a drawing … why? … and then use that drawing to create the toolpath. 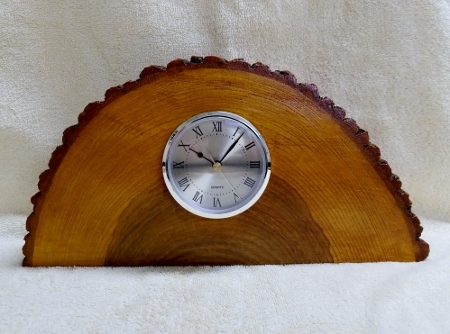 Some extra steps that would not only cost us time but that time expense has to go somewhere and that would mean additional labor costs associated with the cost of the clock … which would eventually be for sale on our website. Want one … get it HERE !! So we started KipwareM® … no drawing required … and with a couple of fill-in-the-blank forms completed … we had our G code program to rough pocket and finish mill … using a helical milling routine … the 3″ hole needed to mount the clock movement. Here are some screenshots of the forms … simple, plain english, fill-in-the-blank forms with tons of machining options that created a quick and efficient toolpath … no drawing nor drawing time required Bang bang done !! As I mentioned we roughed the pocket using a pocketing routine … but we finished the side walls using a helical type cutting routine. Very easy to create in KipwareM® and posted out using KipwareXC® with our X-Carve Profile. We sent the G code and drove the X-Carve using the Universal G Code Sender application. The results were outstanding and the fit for the clock movement was perfect … first shot. Needless to say we saved ourselves a ton of time by not having to create a drawing and by using our shop floor programming ( not CAD/CAM programming ) model and KipwareM®. We did the programming right at the machine … no expensive CAD/CAM system required and no drawing or CAD/CAM experience required. AND … we like the results !! Another unique wood design produced in the KÄRV workshop !! Our Kipware® CNC XChange and KipwareXC® software continue to be the industry leading tools for removing the “control incompatibility” issues from today’s shop floor. Today’s typical shop floors contains many different CNC machines with different CNC controls … and the inability to quickly move G code programs from one machine to another means loss productivity and efficiency. Since 1986 when we first started creating G code conversion software for Raytheon Corporation … Kentech Inc. has become the pioneer and leader in G code conversion software … enhancing efficiency and productivity in thousands of manufacturers by allowing all their CNC machines to operate seamlessly. Today we are announcing the release of NEW features to our Kipware® CNC XChange … Fanuc <–> Okuma Milling Conversion application … that enables a “look ahead” feature for inserting the “next tool” call into converted programs. When converting Fanuc milling G code to Okuma OSP … this new feature will scan ahead in the Fanuc program to find the next tool being employed … and will auto-insert that call into the tool change line of the current tool. This insures greater efficiency by getting he next tool indexed and ready for tool change … saving valuable cutting cycletime in the newly converted G code program. As with all features in Kipware® CNC XChange … and after living on the shop floor for 30+ years … we know that no two G code programs or formats are alike. That’s why we build customizable features into our conversion software … to allow the user to select and customize the conversion and output. Initially … the user can use the powerful USER OPTIONS in Kipware® CNC XChange to set-up this “look ahead” feature as the screenshot below illustrates. ENABLING or DISABLING the Look Ahead function … and if enabled to specify the LETTER ADDRESS to be used by Kipware® CNC XChange when adding the next tool call to the G code. In the above case … a Q# would be output with the # being the next tool number. Users can also specify a TOOL CHANGE RETURN LINE to be automatically inserted as a line prior to the tool change command line, This features gives the user the ability to customize the tool change return line per their own requirements. With a simple push of the CONVERT button … Kipware® CNC XChange goes to work … all automatically … in seconds … to execute this and many other conversions to produce the sample as illustrated below. First the TOOL CHANGE RETURN LINE was added as defined … and then the LOOK AHEAD Q# was auto-inserted onto the converted tool change line. Industry leading Kipware® CNC XChange and KipwareXC® can help any size shop remove the “control incompatibility” issue from their floor … and bring with it increased efficiency and productivity. For more information on Kipware® CNC XChange or KipwareXC® … please visit our website … www.KentechInc.com. OK … I’m gonna admit it … I’m old. I’ve been around machine shops and CNC for more years than I wanna remember … since around 1978 to be exact. I cut my teeth on manual machinery in my 20’s … Bullard VTL’s … turret lathes … open side planers … boring mills … radial arm drills … gear cutters … tool and cutter grinders … and on and on. The company where I was a machinist actually rebuilt machinery … so I had the best of both worlds. A machine would come in and you would get assigned to it with the command … rebuild it. That meant finding what was wrong … re-designing the broken parts … then going into the machine shop and making new ones. I loved that job … and it taught me more than I could have ever hoped. When the opportunity to advance came along … I joined up with the world of CNC. I had the greatest of experiences to take with me … I could fix machines and I could cut metal. I started out as a field service engineer … then applications guy … then manager. Along the way I got some perks like a couple of trips to Japan for training … and I further learnt and upgraded my craft. When things changed and I was asked to move my reluctant young family across the country … I decided it was time to move on and took that opportunity to start my own business. So in 1986 I started Kentech Inc.. I started out doing machine repair … then turn-key projects for Mori Seiki and other machine tool dealers. Along the way I took an interest in macro programming and then taught myself computer programming … and Kipware® was born. The rest … as they say … it history. Why Am I Telling My Life Story? Well if you suffered through the above … you realize … I’m old. But I wear that as a badge … because I have experiences many today can only dream of … and most will never obtain. I make my living now through software running on personal computers … neither one existed for the individual user when I was born. Never mind when I was born … when I was in my twenties … they were still just a distant dream. So when I talk with the “older” machinists out there who have shops .. even one or two man shops … I hear their hesitancy about cloud computing. The reliability, the security, the whole concept … because I’m coming from the same world. I feel your pain. But having done the hard work and the research … I can tell you with all honesty … it’s a pain you gotta get over. The benefits of cloud computing are REAL … SIGNIFICANT … and here to stay. And it’s why I moved my company … one of the first CNC and machine shop software developers … to offer it. Cloud Computing is the FUTURE !! Let me try to give you some of my main reasons why I feel so strongly about cloud computing … and why I think every user should give it serious consideration. And … in fairness … I also list what I feel might be the biggest cons people might perceive. NOTHING TO INSTALL … all applications are run in the cloud … all data can be stored in the cloud or on your local PC … your choice. This is huge … maintaining CD’s and installation files can be very cumbersome. You think you have it … then when the PC crashes … and it will … or you replace the PC … you find out you don’t have it or it doesn’t run on the new operating system. BIG HEADACHE !! WORK FROM ANYWHERE … all you need is an internet connection for access. We hear the question all the time with traditional software sales … “How many PC’s can I install this on.” With cloud computing … it’s limited only by internet access. If the PC … or tablet … or phone … has internet access … AND WHAT DEVICE NOWADAYS DOESN’T ??? … you’re running. WORK FROM ANY DEVICE … we hear this one too “Does it run on a MAC?” With cloud computing … YES YES YES … on a MAC on ANDROID on LINUX … whatever !! What freedom !! NO UPGRADE WORRIES … come on you know this is a major pain. Trying to keep up with upgrades … updates … maintenance agreements and fees … yikes !! With cloud computing … all upgrades, updates, maintenance are FREE … and you’re always running the latest versions of all applications … you’re always using FRESH SOFTWARE with FRESH FEATURES. ALWAYS ON CAPABILITY … ALL applications are always available … anytime. Use applications as needs arise … need to create a quote on a Sunday afternoon from home? EWith cloud computing … NO PROBLEM !! IMPROVED MOBILITY and IMPROVED COLLABORATION … data and applications are available to employees no matter where they are in the world. Workers can take their work anywhere via smart phones and tablets working even while roaming in the shop or in the plant. MORE COST EFFECTIVE … with a predictable monthly expense and with no software, equipment, upgrades and maintenance contracts to purchase … you actually save money over the long term. FLEXIBLE CAPACITY … quick and easy to ramp up and add users or additional applications … still with nothing to install or maintain !! After reviewing the above … I mean REALLY thinking about it … you gotta admit that cloud computing deserves serious consideration. The above are only my favorite reasons … users I’m sure could add many more. Again … coming from the older generation … below are some of the concerns I originally had regrading cloud computing. SECURITY … is my data safe? OK come on … what data? G code programs? Quotations? Estimates? In this particular scenario … The Kipware® Cloud … this is NOT an issue. We’re not talking about storing your banking or company information … our software does not involve anything that would be considered “valuable”. SECURITY II : taking the whole security thing a step higher … our hosting company spends all their time hosting and making sure the environment is safe and secure. YOU DON’T EVEN DO THAT !! So we are already way more secure than even your local PC or company network !! COST : While it’s true you are paying a continuous monthly expense … for that low fee and for what you get and what you don’t have to deal with … upgrade fees, maintenance fees, equipment, crashes, lost time … it is well worth the fee for the convenience, accessibility, scale ability and reliability. INTERNET REQUIRED : come on … really … what device and where isn’t internet accessible? If not now it soon will be everywhere !! So there you have it … cloud computing from an old man’s perspective. BUT … we get it. Cloud computing might still be not right for you. That’s why we offer the BEST OF BOTH WORLDS. You can still purchase any and all Kipware® titles using the traditional delivery via CD or downloadable installation file for installation on a local PC. We aim to please. If you are considering one or more of our Kipware® REAL WORLD software titles for your shop … your programming … your estimating … I would invite you to seriously consider The Kipware® Cloud. More information and complete pricing and package details can be found here at www.KipwareSoftware.com . Thank you for your software interest … and for reviewing an old man’s post ! !